Daily Bitcoin News > Cryptocurrency News > Miner — Is It a Job of the Future? Miner — Is It a Job of the Future? Programmers, web designers, copyrighters, developers and system administrators are among the professions given to us by the Internet and cyberspace. With the development of this field, the list of jobs is constantly expanding. More than ten years ago, when Bitcoin was first introduced, society discovered a few more promising sources of income. For example, the ones brave enough to invest in Bitcoin at the right time have now multiplied their capital hundredfold. And those who did not do that in time started to receive profit from Blockchain in a different way — they began to mine. Let us figure out what mining is, who pays for it, and why miner is a promising job that doesn’t require any qualifications. The term “mining” essentially means the issue of crypto currencies. It is the only way to obtain them, which is based on algorithms for solving complex mathematical problems. In other words, in order to “mine” a unit of a digital currency, you have to find one correct numeric combination (hash) out of millions of options. Computation processes are carried out using powerful computers, and after a miner produces the right hash, he/she receives remuneration (its size will depend on the platform used for mining) to his/her electronic wallet. In the past, in order to obtain crypto currency, you did not need as much money and equipment as you do now. One or two powerful computers and a few GPUs were enough. Nowadays, mining with CPUs and GPUs is simply not efficient. For that purpose, there are special devices — ASICs (Application-Specific Integrated Circuits). The more crypto industry develops, the harder it gets to mine. Stronger competition emerges, and several miners try to find the same hash, but remuneration goes to the one who manages to correctly compute the code before others do. And those who failed get only sizable electricity bills. Thus, solo mining was becoming less viable, and with time, mining farms, which were intended for a more effective mining, started to form. A farm is a number of servers connected to the same pool (Blockchain network). The advantage of group mining is that several computers provide high computation capacity and, therefore, the likelihood of raising hash rate (mining speed) increases, which impacts the remuneration amount. But since the pool is mutual, the profit is also split among all “farmers”. Having looked at two mining variations, we cannot confidently state that solo mining is completely inefficient or that farms guarantee considerable profit. In both cases mining can be described as a “Russian roulette” because a solo miner can simply get lucky, and his/her remuneration will be greater than that of a “farmer”. Consensus building mining is an improved DPoS (Delegated Proof of Stake) with the solved consensus problem, which ensures fairer voting for a delegate than in case of PoS (Proof of Stake). Let us take a closer look at the second type. PoS (Proof of Stake) is a protection method alternative to PoW. The use of such a mechanism does not depend solely on the equipment capacity. It allows forming blocks in the Blockchain network through the balance of delegates. For example, a user owns 3% of the entire volume of a certain crypto currency, and based on the algorithmic solution, on average, he/she will generate a proportionate number of blocks, which is 3%. But we should mention that crypto instruments are constantly improving, and mining methods are becoming more sustainable. That is how the Bitbon System was created, a universal Blockchain platform, whose main difference from the existing mining methods is a fairer and more correct way of voting for delegates, while consensus does not require incredible computing capacity from miners and does not have strong competition. 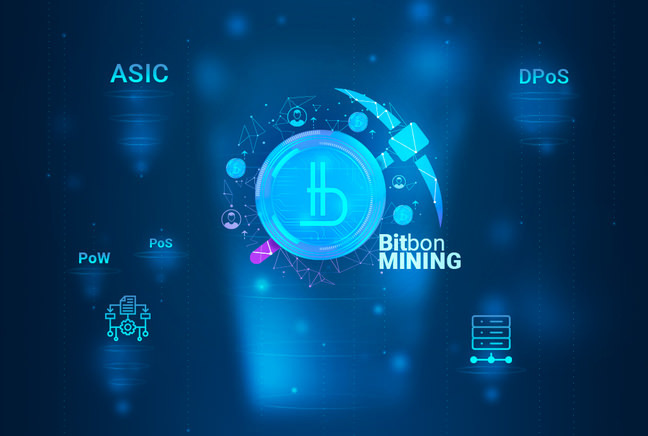 You could say that mining in the Bitbon System is an alternative direction in this field and a promising activity for those who want to find a job in the crypto industry. Mining does not lose its importance, it is getting modified along with the development of crypto industry. The most important thing is to follow trends, keep up-to-date with relevant news and learn about new crypto products. This will allow you to find a profitable job in the field of crypto industry.